The Boaz Community Park is open to the public daily from 5:00 a.m. to 11:00 p.m. Amenities include playground equipment, picnic shelters, ball diamond, vehicle track, horse arena, and a Little Free Library. In season, enjoy fishing along the banks of Mill Creek and snowmobiling on the trails. At the May 9, 2017 regular meeting, the Boaz Village Board enacted an ATV/UTV ordinance. At the January 9, 2018 regular meeting, the Board enacted an an ordinance to amend the ATV/UTV ordinance. To view the ordinances, click here. Route signs are now posted, and all are encouraged to enjoy this sport safely and responsibly. To learn more from the Wisconsin Department of Natural Resources (DNR), click here. 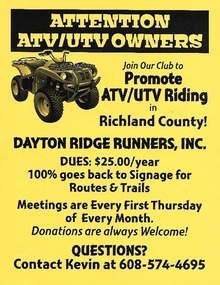 Local ATV/UTV club information is provided below. Rental fees are $50.00 for residents and $90.00 for nonresidents. A $10.00 deposit is required when making a reservation, and the balance is due by the event date. The fee is waived for benefit events of nonprofit organizations within an 8-mile radius of the Village limits; fees for benefit events of nonprofit organizations outside of an 8-mile radius of the Village are at the discretion of the Village Board. For questions or to book your date, please contact Gladys Anderson at (608) 536-3865. Park events are scheduled by appearing at a regular meeting of the Boaz Village Board. To add an item on the next available agenda, please contact the Village President or Clerk. Park fees for high-attendance events – a $100.00 donation is suggested. Horse Arena – there is no charge. Concession Stands – a $30.00 per day required fee if the group cleans, $50 per day (minimum) required fee if the Village cleans. Group may plug in refrigerators and freezer 24 hours prior to the event; there is a $5.00 charge for each additional day of cold storage. Outdoor Park Lights (ball diamond, horse arena, vehicle track) - a donation of $10.00/hour is suggested. Fees and suggested donations offset the cost of electricity and maintenance to ease taxpayer burden. The above guidelines were updated at the June 13, 2017 regular meeting of the Boaz Village Board.